There are some nice public comments in the latest council report about new 20mph areas in Sheffield. Fully support the proposal. My husband has a wheelchair and has difficulty crossing because of speeding traffic. I support the proposal to place a 20mph speed limit around our neighbourhood. Children play out in the streets, and there are also lots of cyclists and to my mind it’s important to prioritise safety over speed. The proposal should see more people walking, cycling and using active transport as a way of getting around the neighbourhood. It could also lead to more people, taking more responsibility for the general appearance of their neighbourhood and being more neighbourly in general. It’s about time people remembered their responsibilities instead of grizzling about their rights and recognise what a privilege it is to not only travel faster than your feet can carry you; but to be able to do it sitting down. 20mph is plenty fast enough in a heavily built up, double parked area such as this. 20mph areas are part of the solution to reducing the barriers to cycling and it’s included as one of the Space for Cycling policies. But it’s important to remember that residential streets need 20mph limits AND removal of through traffic. Until high volume traffic is removed from residential streets (including those where 20mph speed limits are applied) people will still be at risk and too afraid to cycle in them. I live on a 20mph street which is used by over 10,000 vehicles per day and is definitely not a place where people feel safe enough riding bikes. If we replace speed with ‘speed and volume’ in the council’s approach, then we get a much more robust and effective policy. Reducing the speed [and volume] of traffic in residential areas will, in the long term, reduce the number and severity of accidents, reduce the fear of accidents, encourage sustainable modes of travel and contribute towards the creation of a more pleasant, cohesive environment. I think that this point has been missed and forgotten, and that while our residential streets carry significant volume of traffic we won’t see the full benefits of these 20mph areas. The council report includes a paragraph on relying on the residents of areas to make these schemes a success. This is true if the vast majority of people who drive too and from these areas are residents or visitors, but while people use these areas as major transport corridors, the needs of high volume motor traffic will continue to dominate the environment. The key to realising substantially lower speeds on our residential roads lies in affecting a fundamental shift in attitude. 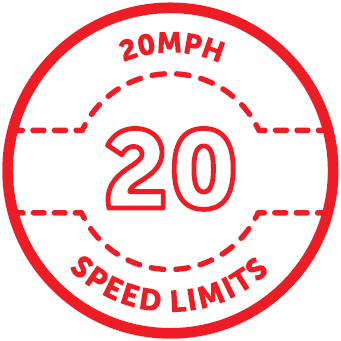 The aim therefore is to build a widespread and longstanding community acceptance that 20mph is the appropriate maximum speed to travel in residential areas. Ultimately, the success or otherwise of these schemes lies primarily in the hands of the residents of this area. Yes to 20mph speed limits, but we need to remove through traffic too. For more information on reducing through traffic, David Hembrow has lots of information on how segregation can be achieved without building cycle-paths, and how unravelling of modes makes conditions better for cycling. 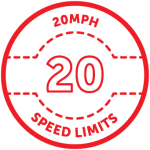 This entry was posted in #space4cycling, 20mph, Space for cycling on September 7, 2014 by Matt.